Native NYC wedding and special event makeup artist, Anabelle LaGuardia, evolved her extensive career 20 years ago through various opportunities in the cosmetics industry epicenter. A graduate of Hofstra University in 1992, she assisted the Beauty and Fashion Manager of Ladies’ Home Journal magazine. In 1997, Anabelle moved on to work for Lancôme as Coordinator to the Associate Vice President of skincare marketing. Simultaneously, she enrolled in, and studied makeup at NYC’s Empire Beauty School. In 1999, Anabelle embarked on her desired career path as an aspiring NYC makeup artist with the then prestigious Upper East Side Laura Geller Makeup Studio. Under Laura’s extensive training and mentoring she ascended the ranks to become one of the studios top requested makeup artist for studio clientele, makeup lessons, high-profile weddings and events. Anabelle appeared on camera as Laura Geller’s primary assistant during several of Laura’s hugely successful QVC home shopping showcases. 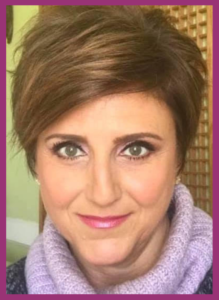 In addition to developing her artistry skills at the studio, Anabelle’s administrative and organizational background in the corporate cosmetics industry was a welcome asset to assisting Laura with the behind the scenes dynamics of running the studio. Having a business background coupled with the talent of makeup artistry have been assets to Anabelle in running her own business. In 2003, Anabelle launched Anabelle LaGuardia Makeup Artistry to provide on location wedding makeup artist concierge services to NYC, the Tri-State area and to destinations beyond. She maintains a loyal referral network of brides, event planners, venues and photographers. Since 2008, Anabelle has been featured in the exclusive wedding directory of New York Weddings Magazine published twice a year. As of 2010, Anabelle has continued to receive the prestigious Couples’ Choice Award for her high caliber of work, attention to detail, five-star reviews and thorough customer service. She enjoys building trusted relationships with clientele and helping them achieve their wedding day vision. In her free time, Anabelle is addicted to the Bravo and ID channels, and is obsessed with Pinterest. She lives with her husband and two cats and loves to paint, Netlix, drink wine, dine out, travel and lounge on the beach. Anabelle is available for travel anywhere in the US and destinations beyond. Inquire within to learn more about the Artist, Anabelle LaGuardia.